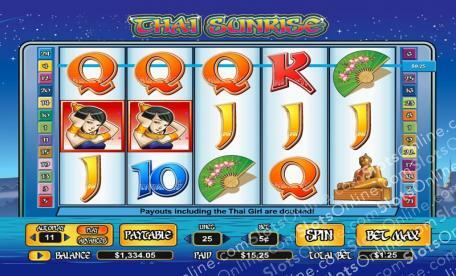 Take a trip to Thailand to discover the beauty of the culture and landscape in this fantastic online slot. Click here to play! Who knows, you might just return with a handsome fortune. While you’re seeing the sites of the Thai landscape, you may just run into the Thai Girl. This friendly beauties will not only payout up to 6000 times your line bet, but she will also substitute for most other symbols to help you bring in more wins. Don’t miss the iconic lotus flowers, as these storied plants are very important to Thai culture. Spin two or more across a payline and you’ll grab up to 1000 times your line bet. You’re sure to also run across a few other iconic symbols while you roam the streets, including taxies, Buddha statues, paper fans, and many more. All of which will help you bring in your Thai fortune. Before you leave, be sure to take in the beautiful Thai landscape under the glowing stars. This symbol is a scatter. Not only will it multiply your total bet if you can spin two or more anywhere on the reels, but it will also trigger 15 free spins if you can spin three of them anywhere across the board. It’s an unforgettable Thai experience that will leave you richer both in mind and pocket. The Thai landscape is a scatter that will multiply your total bet if you spin two or more anywhere on the board. If you spin three or more anywhere on the board, you will be awared with 15 free spins. The Thai girl is a substitute. She will replace all others, excluding scatters, to help you bring in more wins. She will also payout up to 6000 times your line bet if you can spin two or more across an active payline.